Russia’s recent announcement of a massive rearmament drive – worth $700bn (£430bn) through to 2020 – has caused not a little consternation in the West. Maybe it’s just old habits from an uneasy past kicking in, but the truth is, few can still intelligently explain what exactly London and Washington are afraid of. In the aftermath of World War II, the Soviet armed forces were indeed formidable. The largest, the most combat ready, and, admittedly, the most unpredictable geopolitically. The West had something to fear. Many a Western politician lost sleep over the prospect of Soviet tanks rumbling across the northern German plains. But times have changed. The Soviet Union collapsed, the once indomitable Red Army rapidly decayed, and once scrupulously equipped regiments waited decades for new arms. 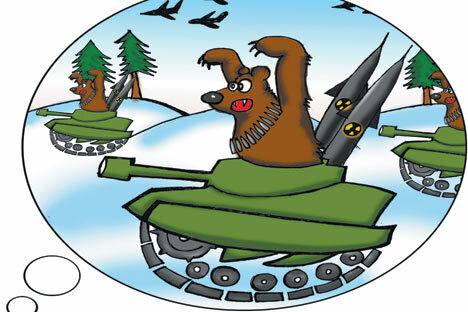 At times during the post-Soviet period, the West was less afraid of the Russian army’s might than it was of its weakness and its poorly controlled nuclear arsenal. Foreign intelligence services were left trying to anticipate which terrorists might manage to get their hands on one or more nuclear warheads from Russia or its neighbors. But the roller coaster of major upheavals appears to have come to an end, and the country has been able to reset its economic model. While many issues remain to be resolved, the state coffers started to fill with billions of dollars, and eventually the time came when fiscal authorities could pay proper attention to the military. The Russian rearmament program was finally adopted, and the government makes no secret of wanting to kill two birds with one stone: to implement the most modern overhaul of the armed forces while investing billions in upgrading a huge number of companies that have diversified into non-defense manufacturing. One would think Western governments would be relieved. The long-obsolete computers that run Russia's strategic forces will at last be replaced by state-of-the-art systems. This means the threat of an accidental ballistic missile launch in a random direction will be greatly reduced. A gradual replacement of the strategic aircraft fleet will also take place. This means nuclear missile carriers will fly accident-free for at least another decade. The number of accidents involving nuclear-armed submarines will fall. And Russian sailors on new vessels will be able to assist NATO, for example, in eradicating piracy along Somalia’s coast. And so the list of common benefits of the Russian rearmament program goes on. But the West is still alarmed, and it seems NATO is always on the verge of panic no matter what happens in Russia. Are we, the Russians, and a hundred or so other peoples living in Russia, really all that intimidating? Or is it that people in the West refuse to understand that life beyond the former Iron Curtain has markedly changed? Who would want to kill the goose that lays the golden egg? Europe remains Russia’s key economic partner. We are already united by hundreds of multibillion-dollar projects, thousands of joint ventures and many millions in investments. What sense would it make to threaten those who regularly accept hordes of Russians for Christmas and New Year festivities, as everyday friends and colleagues? And what would be the point of spoiling relations with Moscow’s strategic partners in the struggle against global terrorism? Yes, Russia remains the world’s largest country with a population that wants to feel protected. Yes, Russian voters must be confident that the government is capable of an adequate response to any external threat, and rusty armaments dating back to the 1960, fighter jets with broken engines and tanks stripped of tracks scarcely fit the bill. Yes, Russia, as well as the West, has learned its lessons from the past and believes in “trust-but-verify” political wisdom. All of this applies equally to the Americans, French, British or Germans, who know that they will be protected and that any threat towards them will be squarely met. Emotions aside, the rearmament of Russia is both logical and justified. Western countries regularly spend billions on defense. Why do the Russians deserve anything less? Vladislav Vorobyov is the international politics deputy editor at Rossiyskaya Gazeta.